Earlier this year we wrote an in-depth article about dozens of suspicious court filings that aimed to remove RipOffReport, PissedConsumer, and other consumer advocacy sites from Google. TechDirt along with The Washington Post originally reported that Attorney Aaron Kelly, Richart Ruddie, and Attorney Daniel Warner were the primary suspects behind these filings, where the defendants were non-existant, signatures were forged, and fake notaries were used. It seems that Google has closely reviewed many of the RipOffReport and PissedConsumer removal lawsuits that Kelly, Ruddie, and Warner filed…resulting in Google re-indexing these once-removed RipOffReport/PissedConsumer web results. Sources have claimed that Richart Ruddie became a referral partner to the Kelly Warner Law Firm, sending over clients to have their negative press on sites like RipOffReport de-indexed. Also, on at least 1 occasion, Richart Ruddie was hired by Attorney Daniel Warner as a professional witness in a Federal Civil case. Video footage would show that the Plaintiff in that case was friends with Ruddie and snowboarded with him on numerous occasions. Additionally it would seem that there would be conflict in hiring a professional witness that is actually a client…potentially waving attorney-client privilege rights. 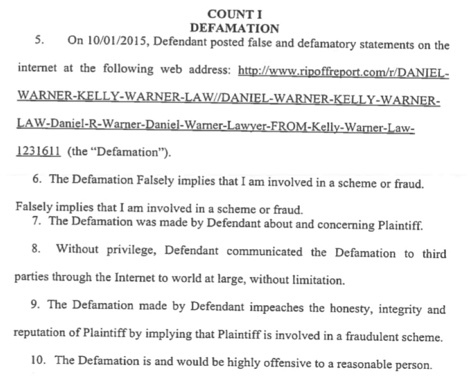 This is, if fraudulent, the most egregious lawsuit of the bunch. Here, Attorney Daniel Warner appears to have orchestrated a fraudulent legal scheme to have a RipOffReport published about him removed from Google. This RipOffReport written about Attorney Warner is likely written by his aggrieved former client, Charles Rodrick. Though the website has heavily redacted the report, you can find the previous version here. The Arizona Republic covered Rodrick’s grievances in depth. “Daniel Warner, who has been called as a witness in the federal case and testified Wednesday, said Rodrick filed a complaint with the State Bar of Arizona alleging misconduct after Warner withdrew from the case. Rodrick even went so far as to file a bar complaint. Considering the likelihood that Charles Rodrick wrote the RipOffReport, Attorney Warner’s subsequent actions are puzzling, at best. Attorney Daniel Warner’s friend and colleague, Richart Ruddie, whom Warner has a relationship with and has worked with on multiple occasions, appears to have filed a fake lawsuit to deindex the RipOffReport. NOTE: Kelly Warner represented Richart Ruddie in the Walters v. Coopers Picks LLC case where Richart Ruddie was sued for Conspiracy and Deceptive Trade Practices. In what appears as an attempt to hide Richart Ruddie’s identity, Ruddie filed a lawsuit listing his name as “R. Derek Ruddie” against another seemingly fake defendant named “Jake Kirschner” that chose to represent himself pro se. “R. Derek Ruddie” AKA “Richart Derek Ruddie” claims that “Defendant Kirschner (Defendant) posted false and defamatory statements about Plaintiff Ruddie (Plaintiff) here. Interestingly, R. Derek Ruddie (Richart Ruddie) is not mentioned one single time in the RipOffReport listing about Daniel Warner. Yet, Ruddie claims in his lawsuit that he was “harmed” by the RipOffReport about Daniel Warner. 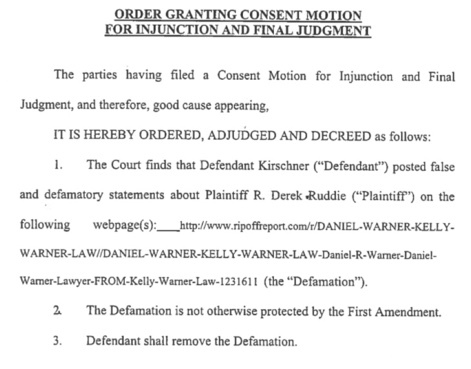 Considering the history that Daniel Warner and Richart Ruddie have together, and Warner’s history of similar lawsuits that appear to have fraudulent elements, it would seem that Attorney Warner, the true beneficiary of this filing, may have played a role in this suit as well. Purpose was to remove negative material from Google. This is not Daniel Warner’s first time attempting to de-index the listing. 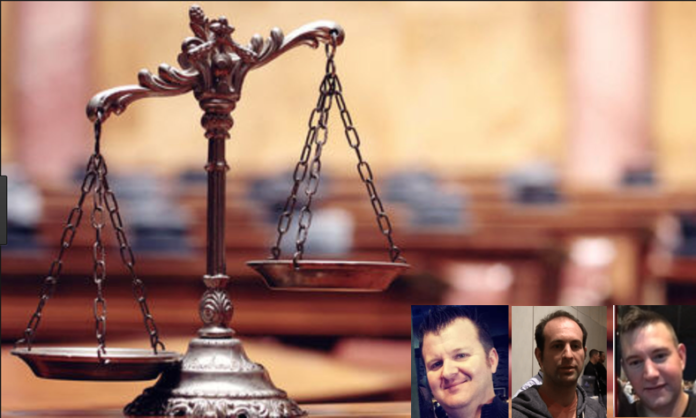 Attorney Aaron Kelly & Attorney Daniel Warner have been under investigation by the Arizona Bar for 8+ months now. UCLA Law Professor Eugene Volokh originally reported these lawyers to the ABA back in March shortly before he ran this article https://www.washingtonpost.com/news/volokh-conspiracy/wp/2017/03/30/libel-takedown-injunctions-and-fake-notarizations/. The Arizona Bar brought the investigation forward as the complainant. We can only speculate that the Bar is taking this investigation seriously, however until a probably cause finding it is unlikely that we’ll receive any updates other than the fact that there is still an investigation ongoing. We have also received confirmation from a source that the FBI is involved in the investigation. No further information is available at this time. Consumer advocacy sites like PissedConsumer, which have been the target of many of the deindexing filings by Kelly, Ruddie, and Warner, are fighting back. Also the Texas Attorney General recently filed suit against another group that is accused of filing fake lawsuits to remove negative publicity from Google. We covered those stories here. Check back with the USA Herald for future updates on this article. If you have any tips of would like to provide us feedback, please call or email us: https://usaherald.com/contact-us/. Convicted Drug Addict Lawyer Stephen M. Compton Reinstated to Practice Law in Wisconsin. Criminal Conviction does not Constitute Reason to Protect Public.